Hermetic Qabalah (from the Hebrew קַבָּלָה "reception" or "accounting") is a Western esoteric tradition of mysticism originating from the Jewish Kabbalah, but being syncretic in nature and an eclectic approach and philosophy encompassing numerology, astrology, alchemy, Tarot symbolism, tantric esoterica, international hermeticism, various occult symbolical systems. It is the philosophical foundation of most Western esoteric societies such as the Fellowship of the Rosy Cross, Order of the Golden Dawn, the Thelemic orders and it is the modern origin of Neopagan, Wiccan and New Age movements. While I don’t subscribe to a particular Qabalistic movement, I consider my esoteric studies as somehow merging as Qabalistic quintessence. Qabalah esoterica, at least the way I practice it, revolves around the study of the Sephirotic Tree (the Tree of Life) and its correspondences in astrology, tarot, various esoteric concepts and general archetypes. DAATH is seen as a place of unification, the “heart” of the Tree, it means Knowledge, but it is seen as the Abyss, for when this point is reached the Tree is dissolved and becomes One, its purpose is complete and Daath is a point of transgression into the absolute, so Daath is a deeply mystical and mysterious convergence of all Sephiroths. KETHER- "Crown": Divine Will to create/Infinite Light of the Creator/the Hebrew name of God "Ehyeh Asher Ehyeh-I Am that I Am"
MALKUTH- "Kingship, Kingdom": Female vessel for the pregnant nurturing of the male lights of the emotional sephirot into action/becomes the Keter Will source for any subsequent lower level in Creation/accomplishment/realization of the Divine Plan. Three Veils cover the Tree of Life and represent the outer limit of existence and the waves of creation. AIN is the highest and first of the veils. It is translated as “nothing”, or simply “no”; it is absolute emptiness, the opposite of existence, complete absence. AIN SOPH is the middle of the three veils, and it proceeds from Ain by necessity. Its translation is 'no limit'. A place of no limitation, similar in vibration with the Ouroboros and the Lemniscate. AIN SOPH AUR is the lower veil, closely wrapping the Tree of Life and it proceeds as the natural continuation of Ain Soph. It means “limitless or eternal light”. This is the Light. This light is the single moment when life is created, the Big Bang, the sparkle, the Chinese Qi, the Hindu Prana, Mana, or Ruah, the vital force. The Tree of the Sephiroth is structured on Three Pillars creating a polarity of energies. Pillar of Severity, made of BINAH (Understanding), GEBURAH (Severity) and HOD (Splendour), an axis that tends to restrain and discipline the energy, and it is similar in energy with Saturn in an astrological chart, although its attribute is basically Yin. On this axis we experience restraint, control, self-control, discipline, challenges, blockages, walls, rules, stagnation, obviously all a necessary part of our integration in reality and spiritual evolution. It could be translated as "per aspera ad astra"
Pillar of Mercy, made of CHOKMAH (Wisdom), CHESED (Mercy) and NETZACH (Victory), is an axis where we experience dynamism, explosive success, expansion, direct gifts, facilitation, excess, the opposite of the first Pillar; its energy is similar to Martian energy, among others and its energy is described as pure Yang. It could be translated as "gaining wisdom and kindness from our gifts"
Pillar of Equilibrium, or Middle Pillar, acts like a bridge between the other two, and it is made of KETHER (Crown), TIPHARET (Beauty), YESOD (Foundation) and MALKUTH (Kingdom) and this is where we experience bliss, union of opposites, balance, harmony, and the Source. It could be translated as "experiencing Paradise"
As a sacred geometric structure, apart from the main principles of the Sephiroths and the Paths, the Tree is rich in geometrical, numerical and symbolic group connotations, such as the dance of the elements within the Tree (fire, water, air, earth) or the Three Triangles that are being formed between the 10 Sephiroths. SUPERNAL TRIANGLE – made of the geometrical structure by which Kether (Crown) gives birth to Chokmah (Wisdom) and Binah (Understanding). Here we experience pure bliss, the eternal spirit, reconciliation of opposites and dissolution of duality. It stands for revelation and knowledge. ETHICAL OR ABSTRACT TRIANGLE – showing how Chesed (Mercy) and Geburah (Severity) give birth to Tiphareth (Beauty). This is the soul incarnating life after life and gathering experience, becoming increasingly aware of the final beauty and meaning of life. It shows how true beauty is finally perceived as balance between Giving (Mercy) and Taking (Severity). 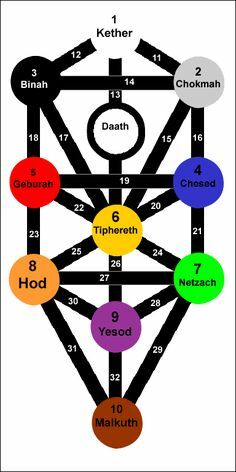 ASTRAL OR MAGICAL TRIANGLE – the level of Netzach (Victory) and Hod (Splendour) giving birth to Yesod (Foundation), a level where we can experience every day magic, starting with a vertical integration of our personality. It stands for the vertical manifestation of divine grace into the every day life plane and also for pure happiness as the foundation for cycles of creation. 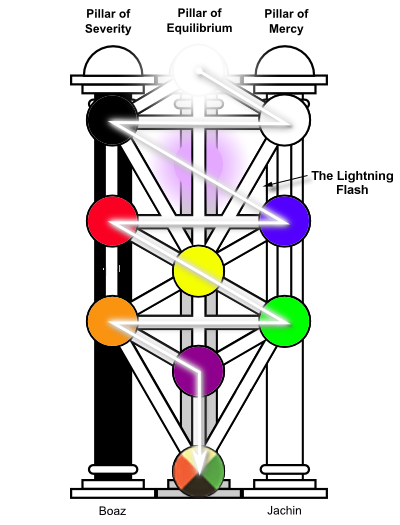 With a Qabalah approach, the Tree of Life is our plane of manifestation. The 10 Sephiroth are ten divine qualities or stages we need to manifest and each life path, each incarnation will be under the primary sign of one Sephiroth. Between these 10 focal points, the Sephiroths, there are 22 possible Paths, from a geometrical combinatorics point of view. The 22 Paths (see photo above) are the bridges we build throughout our life in order to manifest our spiritual and practical life goal, the very sense of our current incarnation. 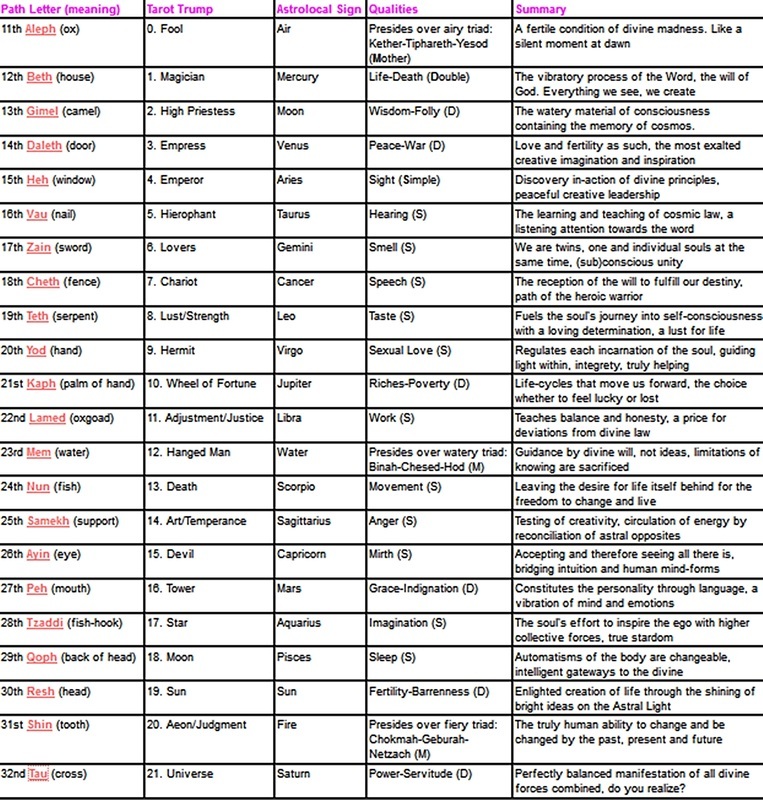 There is a traditional way to determine one’s primordial Sephiroth and it is based on one’s astrological sun sign (also called the Destiny Path). But I found this method as being too generalized, and I add to it a calculation of one’s Path based on their personalized number, which is the Life Path Number (date of birth number). This is your true Destiny Path, in my view, and to it we add the Sun Sign Path as guiding light on this path (just like the Sun is in your chart) . Traditionally, each Path has astrological, alchemical and Tarot correspondences. Each one of you is now on one of these paths, and the Qabalistic analysis is meant to describe your destiny, lessons, life events, ultimate goal by identifying it and telling its story.